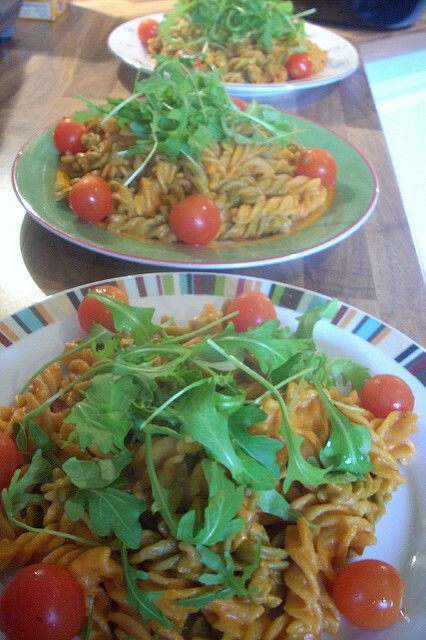 Pasta is a very economical main meal ingredient. Most shops have a variety of shapes available very cheaply and it is so versatile. This is a basic sauce recipe which costs a fraction of the price of ready made jars and tastes better too. It can be jazzed up in many ways – see suggestions at the end. Cook pasta according to the instructions on the packet. While it is cooking fry the onion and garlic in the oil for a few minutes until softened. Add the tomatoes, puree, stock or water, salt and herbs and simmer gently for about 15 minutes. for a more traditional bolognese type sauce. Beans, sweetcorn, peas. A sweet and sour sauce is easy to make also – add a can of pineapple pieces in pineapple juice and leave out the herbs. A little vinegar is added too and 1 teaspoon of sugar.